Event Organiser Pro allows you to quickly and easily e-mail selected bookees from the admin screen. 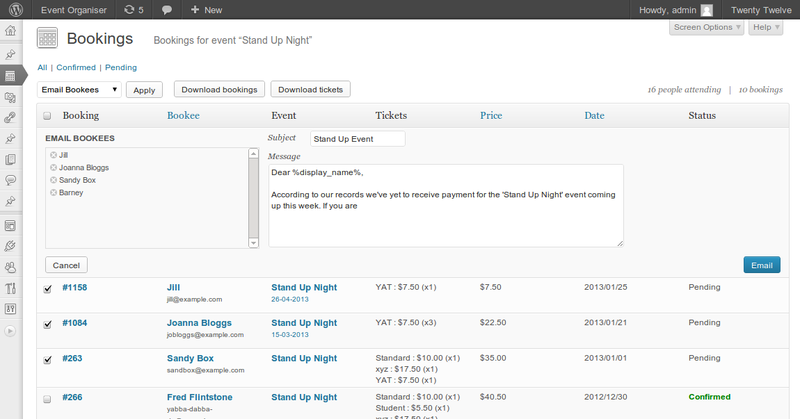 Simply select the relevant bookings, select ‘Email Bookees’ from the drop-down menu at the top and click apply. You can easily email attendees to a certain event by filtering the admin table by event and/or booking status, before checking the ‘select all’ checkbox at the top of the column. This selects all bookings on that page, so you may wish to adjust the number of bookings on a page via the screen options. The template option under the ‘Bookings’ tab in the plug-in settings page allows you to select, and preview, various templates to give your e-mails more visual appeal. If the default templates are not to your taste, or you want a more integrated look the Event Organiser API allows the default templates to be extended. And its heart an e-mail template is simply a php file that lives in your theme (preferably child theme) with a particular comment header that allows Event Organiser to recognise it. You can include images in the template, but you must use an absolute path to a hosted (i.e. not local image). Excessive use of images will increase the size of the e-mail, and may make sending the e-mail slow. What styling is supported in e-mails varies between e-mail clients – the best advice is to keep in basic. A lot of hosts will limit the number of e-mails you can send from your site in a specified period of time (typically a daily or hourly limit). If you’re expecting a large volume of bookings – or wish to e-mail a large number of bookees, you may hit this limit. Speak to your host. They may be able to offer a solution which involves raising, or removing this limit. Install WP Mail SMTP to send the e-mails via an e-mail service provider (e.g. G-Mail). See set up instructions below. WP Mail SMTP is a quick and free method to send e-mails via a third party e-mail service provider and so avoid your host’s limits. And it works along-side Event Organiser without any problems. Here’s how to set up the plug-in. 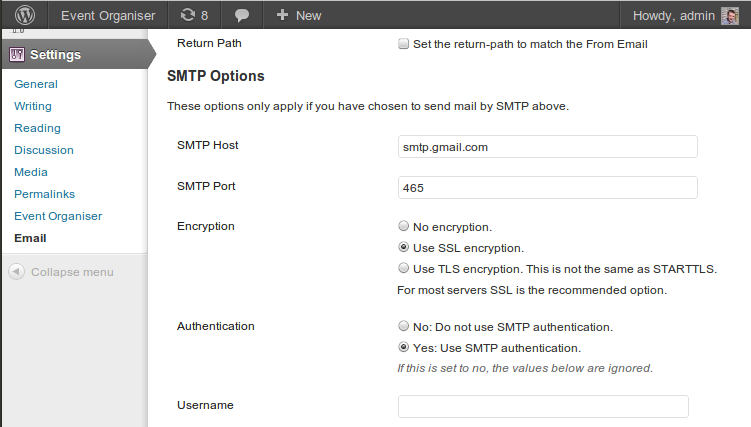 Once installed go to Settings > Email and select for WordPress to send all WordPress e-mails via SMTP. Finally enter your username and password for the e-mail service you’re using, and you’re done.